Oahu is the third largest island of Hawaii, but also the most populated one, since Honolulu, the state’s capital, is located on the south shore of Oahu. In total, Hawaii consists of eight main islands: Niihau, Kauai, Oahu, Maui, Molokai, Lanai, Kahoolawe, and Hawaii (also known as Big Island). I will start this post with an old Hawaiian legend, for to all of you who love spooky things and wouldn’t mind going on a ghost hunting trip. If you ask any person native to Hawaii, the term “nightmarchers” will ring a bell. Legend has it, that in the late 1700s, king Kamehameha I from Big Island wanted to unite all of the Hawaiian Islands and so, he invaded Oahu in 1795. After many hard-fought battles, Kamehameha I finally won and decided to force nearly 400 warriors of his opponent down a cliff near the Old Pali Road, in the east of the island of Oahu. This is the beginning of the legend of the “nightmarchers”, as the souls of those heroic warriors are still believed to roam the island and protect it from strangers who mean harm to it. Sometimes, during the night, their drums can still be heard in the forests close to the Old Pali Road. Some even say, they saw the ghost soldiers marching with torches or even falling down the same old cliff where they had come to their death decades ago. This is also believed to be the reason for many supernatural or violent incidents in this area, with an especially famous one being Morgan’s Corner, where more than just one person was murder in the last 60 years. On a slightly less haunting note, very close to this area, there is lovely place to go on a little hike, called the Judd Trail, that will lead you to the infamous Jackass Ginger Pool, a little pond with a tiny waterfall that has been a popular spot for taking a bath for centuries. If you drive a little more east, all the way to the shore, you will reach one of the most beautiful beaches of Oahu – Lanikai Beach. The name means “heavenly sea” and I can confirm this to be true. The water there was incredibly clean and home to lots of fish and other animals of the sea. From the beach, you can beautifully see the two twin islands Na Mokulua. You should definitely look into renting a kayak at Lanikai beach to go visit those two islands. It doesn’t take you too long to get there and the snorkelling around those islands is absolutely worth it. Some websites even offer kayaking tours with pickups from almost all Waikiki hotels included. The west coast of Oahu, too, is worth a visit. One thing you might not know about me is that I love animals and my favourite animals have to be dolphins and whales (besides my dog Oscar, obviously). So, when I found out that there are great dolphin and whale watching tours on the west coast, I had to book one. I went with Dolphin Excursions (I will link them down below) and it was a great decision. They picked us up in Waikiki early in the morning and we headed to Waianae Boat Harbour. Accompanied by a very nice and experienced captain and a wildlife expert and photographer (who took the pictures you can see below), we spent half of the day at sea looking for dolphins. We managed to find two different pods of dolphins with the first one consisting of at least 200 individuals. When we met the first school of dolphins, we were quite far off shore and the ocean was about 2100 feet deep (about 650 metres), so I had to overcome my fear of the open ocean in order to jump in and swim with the dolphins. With hindsight I have to say that it was 100% worth it. Later, we found a second pod of around 60 dolphins really close to shore in a little bay and we had another chance of swimming with them. This time, they came really close with was super exciting. All together a total dream, come true! Unfortunately, however, we didn’t see any whales, but then again, September is not really the right season for that (November to February is the one). If you decide to go on one of those excursions, make sure to be respectful and super careful when dealing with wild animals: don’t scare them by splashing or making super loud noises, don’t touch anything, and also don’t chase the dolphin, turtles, seals, or any other animal (in fact, this is even forbidden in Hawaii and I you are caught, you will be fined). Oahu is also home to many great hikes and waterfalls! 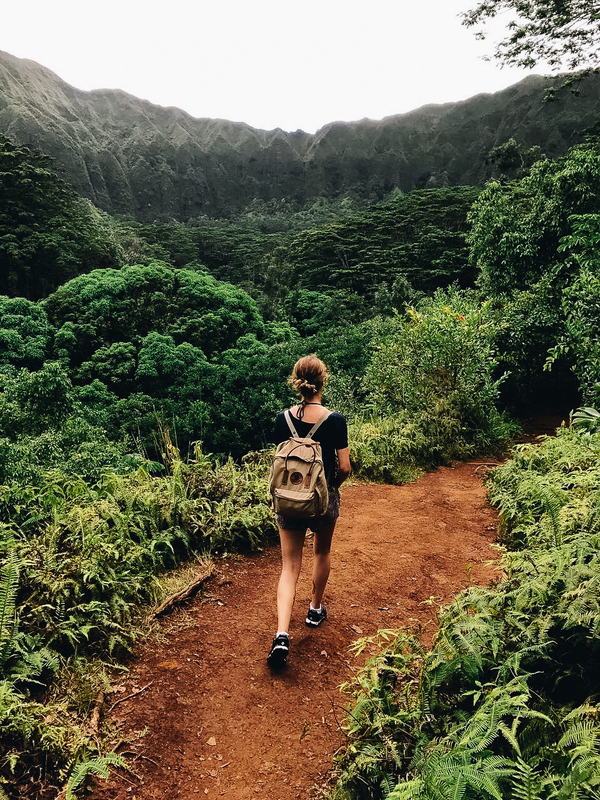 Make sure to bring your sportswear and hiking wear, because you don’t want to miss out on the beauty of Hawaii’s nature. Two of the most iconic waterfalls on Oahu are the Manoa Falls and the Maunawili Falls. When hiking there, don’t forget to bring a towel and a bikini, because you will want to jump in, because hiking in Hawaii can get really hot really fast. Also, always be prepared for sudden rainfalls when in the rain forest and don’t forget to bring a sweater or jumper when travelling by bus, because otherwise you will freeze to death on public transport. For the really advanced hikers out there, I can recommend the Three Peaks Hike and also the Stairways to Heaven Hike. But, always make sure to stick to the official routes and not some illegal pathways, and always bring a friend or a guide. Never go on your own! At last, I also have to mention the north shore of Oahu, which is equally as beautiful as the rest. We once went to a beach on the north shore at night and saw many incredible shooting stars. Make sure to also visit the little town of Haleiwa for some great acai bowls, poke bowls and shave ice. This is it for this week’s post. Next week, I will tell you a little something about the infamous Pearl Harbour and the Byodo-In Temple. Until then, let me know in the comments down below what you thought of this post and if you would like to do any of these activities yourselves!